If you’re looking for a day or overnight trip in New Jersey, let me recommend Historic Smithville in Galloway, where you’ll feel like you’ve been transported back in time to a quaint village complete with cobblestone walkways and footbridges. 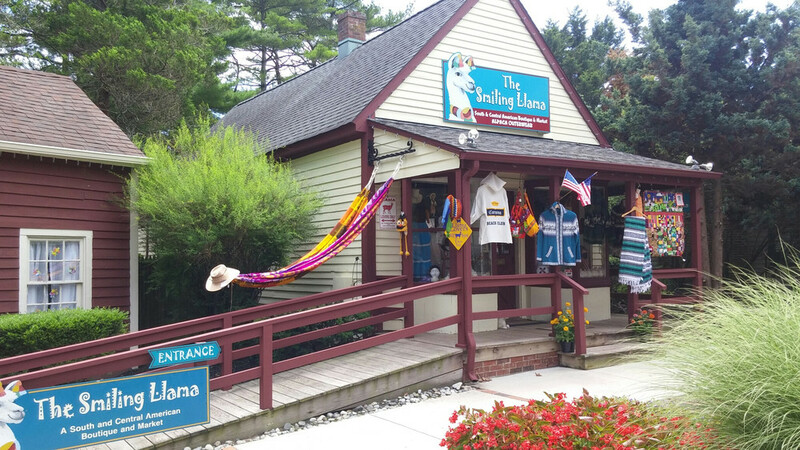 You won’t find Marty McFly or a broken clock tower, but you will find 60 shops to explore, one of which is NJBIA member The Smiling Llama. 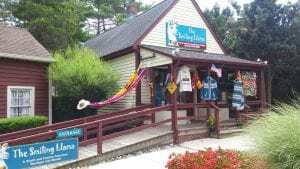 The shop, owned and managed by the husband and wife team of Jeff and Cheri Bitter, offers a wide variety of handcrafted items celebrating South American culture, with special emphasis on clothing woven by hand from alpaca fiber by Peruvian and Ecuadorian artisans. The couple’s love of this culture started with their raising of alpacas and llamas, which they still do today. In fact, one of the main reasons for opening the shop was to provide a brief education to visitors about the history of llamas and alpacas from Peru and Chile. While alpacas and llamas are closely related in the camelid family, the difference in their coats is what interests clothing makers. A llama is much larger than an alpaca and its outer coat is coarser. An alpaca has a very thick and luxurious coat and has been domesticated and carefully bred for over 500 years for this luxury fiber, often referred to as fleece. Alpaca fiber is valued for its unique features that are superior to traditional wool, from sheep. First, alpaca fleece is naturally hypoallergenic, because it contains no lanolin. Second, it is softer and warmer than traditional wool. Third, it’s naturally water-repellent. Visit The Smiling Llama’s website to see a host of items from clothing and outerwear to jewelry to purses and Peruvian pipes. I encourage you to explore the “clothing/outerwear” section, as the patterns and colors are truly vibrant and leave no doubt that such items are truly made by artists. One of the other main reasons the Bitters opened the shop was to be part of and support the Fair Trade Federation, which is a North America organization devoted to building equitable and sustainable trading partnerships and creating opportunities to alleviate poverty. They are particularly focused on supporting fully committed businesses in order to expand markets for artisans and farmers around the world. If you do visit their shop, you can also indulge in a sweet treat at The Smiling Llama’s Water Ice and Pretzel, also located in the Historic Village of Smithville. In addition, The Smiling Llama has a second location at Woodland Village in Clermont, NJ, which is open seasonally. Beyond their website, you can learn more about The Smiling Llama by visiting their Facebook page or by following them on Twitter. The Smiling Llama is just one of 20,000 companies that comprise NJBIA’s membership, which is very diverse with representation from an amazingly large and wide spectrum of fields, industries and professions. Look for more unique stories about NJBIA members in future issues of “Beyond 10 West Lafayette,” NJBIA’s membership blog.